I love tart frozen yogurt and have been trying to find a good recipe to use with my ice cream maker. I finally found a recipe that I love - because it fits the bill for being easy and adaptable! I haven't made any other flavors yet but clearly adding fruit and/or chocolate chips, etc. would be great. I forgot to take a picture before my family devoured the end result so you just get to see the ingredients. Whoops! It is best straight from the ice cream maker but it freezes fine. You will just want to soften in for about 20-30 seconds in the microwave or let it sit out for about 10 minutes before eating it. The great thing about this recipe is that 1/2 cup serving has around 5 grams of protein - not bad! And under 200 calories. And it tastes WAY better than the store bought stuff. 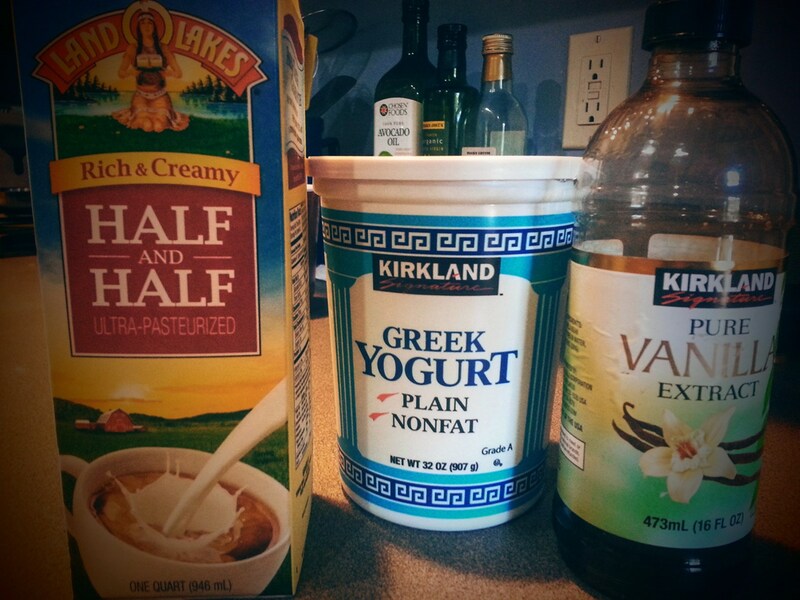 I think you could experiment using milk instead of cream - or non-fat evaporated milk, if you want to reduce fat. Alternatively you could use full-fat Greek yogurt and milk. I personally like there to be some fat to make it creamy! Mix all of the ingredients minus the add-ins in a bowl. Add to the bowl of the ice cream maker and freeze according to the manufacturer's instructions. Best consumed soft - super creamy and very yummy. » A possible cure for pimples? It's all in the bacteria. » Soup time! Black Bean Sweet Potato Soup in a Snap! Subscribe to our mailing list and get 15% off your first order! Note: you must reply to our confirmation email to receive the coupon code!